I've been ordering from that dreading place called MAC again, oops. I did need some more seen as though I don't have many & I really enjoyed my last purchase, it kinder brought me back for more. What I need next is one of their refill palettes. Seen as though the collection is finally starting to grow, yippee! I've not included a make-up look with these shadows in this post, as I thought I could save that for another day. Would you purchase it again? Definitely! When I wear this eyeshadow I feel like it makes my eyes look more awake if you get me and I have to have a second glance in the mirror when I walk past. That made me cringe typing that haha! I meant at the eyeshadow itself and not at me of course. 'Naked Lunch' looks so pretty when applied all over the lid of the eye, it applies a light amount of colour and shimmer. 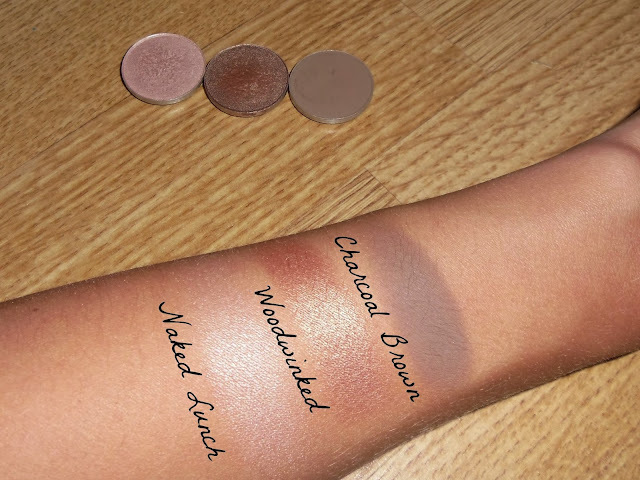 You can probably tell in the swatches included in this post. Would you purchase it again? yes, yes, yes! I like to pair 'Woodwinked' with a vanilla, or yellow based light shadow. That's if I'm not wearing it all over the lid. Mind you I always change how I wear this one, like today I'm wearing 'Naked Lunch' with 'Woodwinked' blended into the crease. Would you purchase it again? couldn't live without it... so that's a yes! I use this eyeshadow mostly to fill in my eyebrows, it works like a dream. It's the perfect colour for my brows. Previous to this shadow I were using a Rimmel eyebrow pencil, but I felt like it made my eyebrows appear to harsh (like slugs had been drawn on my face). This shadow when applied with a flat brush makes them appear more natural. It also works beautifully as a crease colour, you can build it up to get a darker effect for a more smoky eye look. 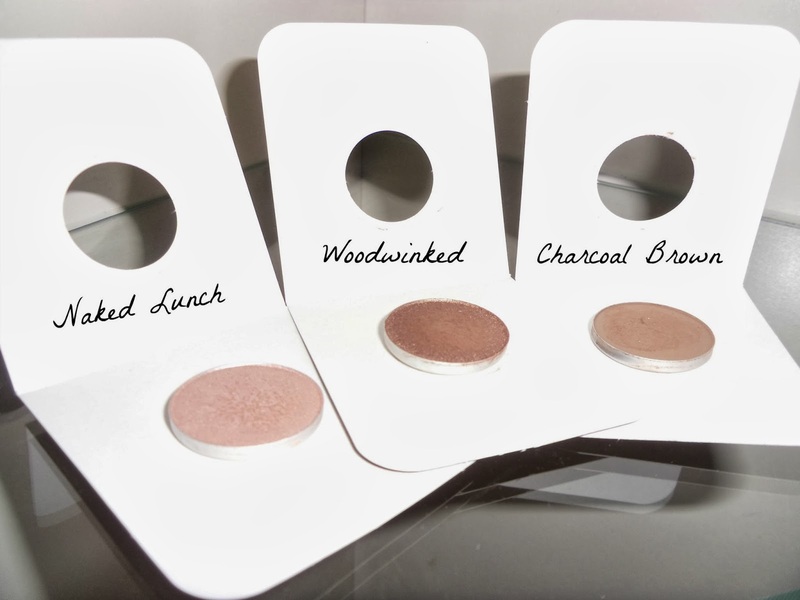 Overall I am really happy with my new MAC eyeshadows and the last one's I posted about too. They are all must haves to me and I will repurchase if I ever hit pan (which I hope that's not for a while). I think I've built up some kind of addiction to MAC over the last few weeks. I've already got some more shadows waiting in my favourites/basket ready for my next purchase. I also really like the look of the MAC paint pots, but I haven't tried any before. Are they as good as every makes out to be? Now I'm in need of some neutral matte eyeshadows as I don't have many in my little collection. You know for those days where you don't want to wear anything shimmery and you want to tone it down a tad. Matte's always look nice on a your vintage inspired make-up looks too, so I'm desperately after some. Does anyone know of any must have MAC matte eyeshadows? The questions I answered about each eyeshadow are my own opinion. You may think different to me, but I go by what colour or shade the eyeshadow is through my own eyes and on my own skin. I've just had a little look of the swatches for bare study and it looks like my cup of tea! ahh you are such a nightmare! you make me want to buy more and more haha :) I also like the look of the 'painterly - paint pot' it looks so pretty. Woodwinked looks amazing! I want ittttt!! I'm so jealous of you and your MAC makeup! I'm surprised there's a tan on that arm! I've done nothing but exfoliate my body for the past week, that holiday really dried my skin out and I went all flakey D: (making myself gip, never mind anyone else) ha! I reeeeally want woodwinked, looks like my perfect shade! in the pan it doesn't look that much, but when it's on the lid it's gorgeous! Wow the shades are gorgeous ! I think all three of them are must haves in your palette! Love these colours! They're on my xmas wishlist!! oooooh i am so jealous of your little growing collection! I love the finish of woodwinked, looks perfect for the winter months! Heard so much about charcoal brown for the brows, maybe i will have to make a cheeky purchase once my look brow perfect kit has died on me. Woodwinked is one of my favourite eysshadows from Mac. I wear it a lot during the fall and winter :) I would love to try naked launch. Such a pretty colour. Slugs drawn on your face - I can imagine! :p At least you found a product which proved a much better alternative. Surprisingly I have never tried MAC eyeshadows - though I've been tempted by a lot of their shades, especially Patina and Satin Taupe.